Prenuptial agreements have exploded over the past 20 years, not only among celebrities, but also for all types of people who desire to protect, manage, or enhance their personal, family, or business assets against foreseen and unforeseen circumstances. Attorneys have been assigned the task of cutting through a morass of issues to create agreements that achieve the goals of their clients while meeting complex, and often subtle, legal requirements. 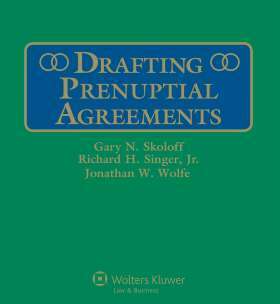 Drafting Prenuptial Agreements is the first guidebook ever to cover this growing area of family law. Written by Gary N. Skoloff and Richard H. Singer, Jr., Skoloff & Wolfe, Livingston NJ, and Ronald L. Brown, Editor, American Journal of Family Law , Aspen Publishers, Drafting Prenuptial Agreements presents a pragmatic approach to preparing successful agreements quickly and effectively in any situation by grouping together and identifying the common areas that need to be addressed. The authors guide you through planning the agreement and the types of issues to discuss with different clients. This thoughtful organization gives you easy access to the tools you need to clearly present the range of choices to be addressed in each type of agreement and situation. YOUNG-YOUNG, EQUAL ASSETS—For young people in the early stages of promising careers, where each has some assets and wants to protect these, as well as their careers, as separate property. YOUNG-YOUNG, DISPROPORTIONATE ASSETS—For people of middle age or younger, where one already has, or is likely to acquire, substantial assets, and wants to protect these assets as separate property, while reasonably providing for the needs of the marriage, as well as the spouse and any children upon divorce. YOUNG-OLD, DISPROPORTIONATE ASSETS—For a couple with a large age disparity, where the older party has substantial wealth which he or she wants to preserve for his or her estate, and also wants to provide for disability or incapacity. OLD-OLD, DISPROPORTIONATE ASSETS—For an elderly couple, where one party has substantially fewer assets than the other, yet is comfortable, and where both want to protect their separate property, provide for a comfortable lifestyle during the marriage and reasonably provide for the spouse with fewer assets upon death or divorce. OLD-OLD, EQUAL ASSETS—For older parties with similar assets who want to protect their property as separate, yet provide an arrangement by which they can live commensurate with their resources. Drafting Prenuptial Agreements includes a CD-ROM with sample agreements and hundreds of time-saving clauses! Note:Online subscriptions are for three-month periods.